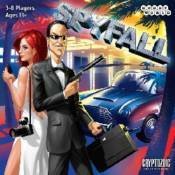 SPYFALL is an easy-to-learn card game of bluffing, probing questions, clever answers, and suspicion. At the start of each round, players receive a secret card informing them of the group's location � a casino, space station, pirate ship, circus, (30 unique locations!) � except that one player receives the SPY card instead of the location. The Spy doesn�t know where they are, but wins the round if they can figure it out before they blow their cover! Players then start asking each other questions during the intense 8-minute rounds. Non-Spy players want to ask questions and give answers that prove to the other players that they know where they are. But watch out! If your questions and answers are too specific, the Spy will easily guess the location and win, so you need to practice a bit of subtlety. But if your questions and answers are too generic, you might be accused of being the Spy. The Spy will also sometimes be asked questions (just like any other player would) and have to come up with questions of his own, without knowing anything about where he is! If you listened carefully to the other players, you�ll be able to come up with a plausible question or answer� hopefully. Once per round, each player may accuse another player of being the Spy. If all players agree, the game ends and that player�s secret card is flipped up. If the Spy is captured, each of the Non-Spy players win the round. If a Non-Spy is revealed, the Spy wins. Finally, if the Spy figures out where they are, they can reveal their card and make a guess. If they're right, they win the round. If not, the Non-Spy players win.